A few snaps of the kitchen, which received a jolly good scrubbing today. Because I am avoiding those several kilos of quinces that need preserving. We're slowly learning to use the Rayburn, our lovely English girl. It's taking a lot longer, to, well cook on it that we thought. Fires need to be stoked at around 2pm to get the oven hot enough to cook dinner. But we rarely get there, with the temperature languishing at around 150 degrees for hours and the children having last minute grilled cheese on toast, which still takes about 30 minutes using the Rayburn. Then finally tonight's dinner is ready at 10pm, so it becomes tomorrow's lunch. When the oven does work, and is firing nicely, the results are amazing. Nothing dries out in the gentle cast iron heat. And anything slow cooked is marvellous. It's comforting to hear the noise she makes as the water fills up and she gurgles and glugs, heating our hot water cylinder. You can hear how the fire's going too, by the crackle and ticking noise the oven makes. That noise in the background keeps me company when I'm home during the day. Lets me know what's going on and if she needs my attention. Just like a child, silence usually means trouble and the fire's gone out. She's a little bit contrary, but extremely capable when she feels like it. And we love her dearly. We've yet to think of a name for her, I'm not entirely sure, maybe after my one of grandmothers, Hilda or Cecilia. What do you think? Do you have any suggestions that might suit this contrary English lady? P.S. here's what the kitchen usually looks like, taken on Sunday morning. 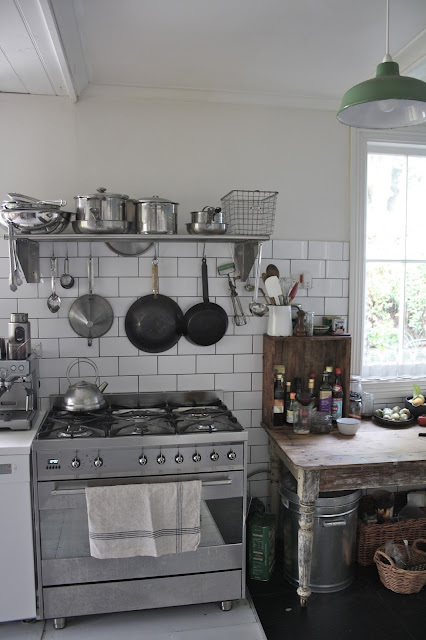 Hi Michelle, I love that your space is a serious cooks kitchen but also feels very homely! It sounds like interesting times with the Rayburn, your description is beautiful. I grew up with an Aga in the house and cooking with it required a similar strategy! Your description is beautiful, it evokes such lovely images but really does seem like a labour of love as you manage something that won't yield to your timetable or temperament. It would kill me. I like to be the boss in my kitchen. I like the name Hilda - it is a no-nonsense, in charge kind of name. What a gorgeous kitchen! So country, so homely, so awesome! I think call her Cecilia and then you can call her CeCe... too cute! Your kitchen is what I dream of. I prefer your style over the fully built in kitchens that most people have. I particulary love the old table in the corner and that it is in front of a window. We have a table pretty much identical in our kitchen but ours is painted white. Recently I've been thinking of sanding the top back to raw timber as it marks too easily being white. Seeing yours makes me want to do it even more. Do you clean the timber top with anything in particular? Oh, I love the name Cecilia. Thanks Sarah, i do like freestanding kitchens better than built ins. The table is really old cruddy, but the top is Huon pine, not treated in anyway. I don't use anything except a damp cloth to wipe it down. I think she has to be a Cecilia. Still sounds commanding but also beautiful - which she is! Oh your kitchen is a dream, everything about it is perfect. I keep coming back to this post and staring at your kitchen... that is the type of kitchen that memories are made in. I can imagine you will be sitting at that table the day your children tell you, you are going to be a grandma. Its the table wine and champagne and beer will be drank at. Tears will be shed, laughs will echoe, stories will be told... oh man am I jealous of that kitchen! Dido to Mumma Drogi! I also love that in soaking up your photos I spy the exact lamp shade I have been searching for ... the greenish warehouse type... do you recall where it came from? PS Dare I say it but 'Oh Cecilia... you're breaking my heart... I'm begging you please (to come to temperature!) ). My vote is still for Cecelia though; strong, but beautiful. Oh my goodness, I am BUSTING to come over for a cuppah and some of your jam on your toast. Your kitchen looks just about as gorgeous and homey as you can get. I even love (and am slightly terrified) that the cooker is a slow, all day affair. I love that she has her own personality. And my last box of quinces ended up in the compost. That smell finally got too much for me. I have utter kitchen envy. So beautiful. I do like Cecilia, but my first thought was maybe something from a Jane Austen, Emma perhaps. I miss sitting there with you. Oh I go for Cecilia too. I love the mix of industrial and country styles in your kitchen, perfect. Love the light and space. I bet Cecilia will be cranking tonight, it's so cold today. That last photo made my day. So many photos on blogs show the beauty, this one shows the true beauty! That kitchen makes me green with envy every time I see it! I am in awe of your kitchen...everything about it has my heart a flutter! Love your kitchen! How are the stainless steel benchtops to keep clean/maintained?? Sorry, but Hilda just does not suit the term 'contrary English lady'. My husband's Nan was called Hilda, she was a lovely gentle woman...only once in all the years that we knew her were we surprised to hear her mutter..."If the Lord is kind he will take him (meaning her husband) first and give me a few years of peace". My husband & I couldn't believe what we had heard coming from such a quiet & gentle woman, and we still have a good laugh about it now. Fanny, Tuppence or Lettice believe it or not all lovely old English names! just found you via Bleubird! Your kitchen is gorgeous and your blog is lovely too. this kitchen is unreal. I WANT! beautiful. I really enjoy reading your blog and reading about life in Tasmania. I absolutely love the kitchen and the recipe posts are my favourite. living as part of my Masters at the University of New England, Australia. Funny. My parents names are Hilda and Cecil. Love the kitchen, btw. I love, love, love your kitchen! only once in all the years that we knew her were we surprised to hear her mutter..."If the Lord is kind he will take him (meaning her husband) first and give me a few years of peace". My husband & I couldn't believe what we had heard coming from such a quiet & gentle woman, and we still have a good laugh about it now. those two copper tubes coming out from the Rayburn, are those for the heating system? I mean delivering hot water to the radiators?